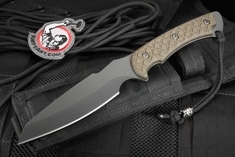 Spartan Blades Hybris tactical fixed blade knife designed by former US Special Forces Operators Curtis Iovito and Mark Carey. Iovito and Carey are the co-founders of Spartan Blades USA and wanted to design a great all around combat utility knife. 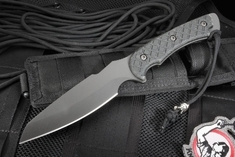 The blade is constructed of American Made CPM S35VN steel with a blade hardness of 59-60 HRC. The blade length of 5 7/16" ensures that this fixed blade can tackle tasks with confidence. Blade features a sheepsfoot design that cuts fantastic and stands up to heavy use. Blades have a SpartaCoat PVD coating for reduced glare. The handle of the Spartan Blades Hybris is constructed of canvas micarta with a checkered texture for added grip. The Hybris is a full tang fixed blade with an integral lanyard hole in the rear section of the handle. Paracord lanyard is attached. The Hybris fixed blade comes with a high-quality Spartan Blades MOLLE Nylon Sheath. Rugged 1000 Denier Cordura and MIL-SPEC webbing construction with edge binding and double stitching. Form fitted Kydex / felt liner that snuggly holds the blade. Adjustable snap closure retention strap for the knife handle. Belt Loop adjustable to fit most belt widths ( up to 3.5"). 3 rows of PALS webbing on front to attach a small pouch (pistol mag or accessory). 5 rows of PALS and 550 paracord lace on the backside to attach to MOLLE / PALS vests, packs, belts or gear. (Can be configured to wear vertically, horizontally or diagonally) .